Today the Policing Project has released its report summarizing public and officer feedback on the LAPD’s policy for releasing video footage of critical incidents—which includes any incident in which an officer fires a gun or an individual dies in police custody. 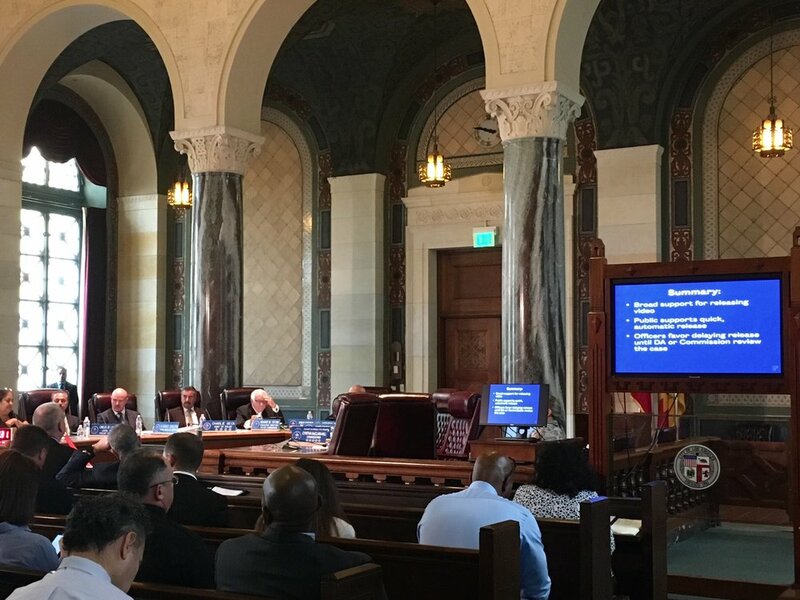 The report is based on a citywide community engagement process that the Policing Project conducted at the request of the Los Angeles Police Commission last spring. The report showed broad agreement that video of critical incidents should be released at some point, but sharp divergence between the views of those in law enforcement and those in the general public as to when that should happen. Members of the public favored relatively prompt release of video—within 60 days of the incident (and many felt it should be even sooner). Those in law enforcement, on the other hand, felt that video should not be released until the District Attorney makes a decision about whether to bring charges against any of the individuals involved. In Los Angeles County, this can take up to two years and sometimes longer. The public also preferred that video be released automatically at some fixed point in time, instead of leaving the decision to a case-by-case determination by public officials. There was widespread concern—shared by some in law enforcement—that any such case-by-case determination would be politicized. In general, members of the public expressed a lack of trust in any particular entity or institution to make the decision in an apolitical manner. In gathering input on the LAPD’s video release policy, the Policing Project worked with public officials and community organizations—as well as academic partners at UCLA and UCI law schools—to hear from as many interested parties as possible. Between March 23, 2017 and May 7, 2017, individuals and organizations were invited to go to www.LAPDVideo.org where they could view a variety of educational materials, and either take an online questionnaire or submit more detailed written comments. The Policing Project and its partners also held five community forums, and conducted focus groups with members of the LAPD. Police Commissioner, Matt Johnson, thanks the residents of Los Angeles, the Los Angeles Police Department, the Mayor of Los Angeles, the Policing Project and all the organizations that provided input from the Los Angeles communities. “I would like to thank everyone that contributed to this process, especially those individuals and entities that provided us with their thoughts and opinions. We will take all of this great feedback into consideration along with California state law, privacy issues, transparency, as well as other interests as we craft a draft policy for further consideration by all interested parties, including members of the public.” The Police Commission expects to implement a new policy which will provide direction as to when and how video from critical incidents including officer-involved shootings, will be released. The policy is to be issued later this year before the completion of the Department-wide implementation of patrol officer body video cams. Copies of the report can be found on the Policing Project website at www.policingproject.org, the Los Angeles Police Department website www.lapdonline.org/police_commission, and below.